Have you ever tried baked oatmeal? I had never even thought or heard of such a thing until I found it on a blog a couple of weeks ago. Given that I love oats I knew that I had to try the recipe. By now you recognize the pattern, as we have had several recipes with oats in them…apple crisp, granola, cranberry oatmeal bars. 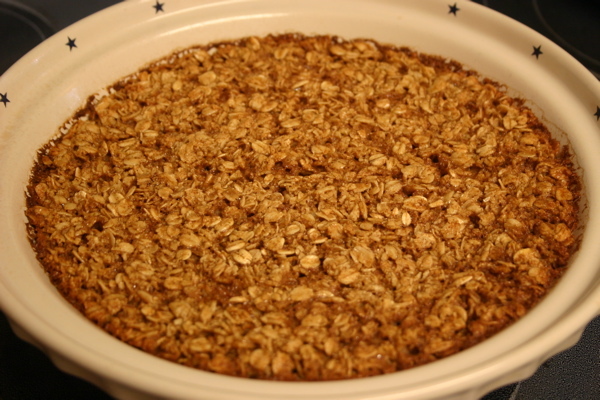 I could go on and on about all the different ways I enjoy oats, but I had never tried baked oatmeal before. Anytime I try a new recipe, I’m always curious and sometimes apprehensive about the outcome. The verdict on this dish? It was delicious! The dish is drier than a traditional oatmeal and not as gooey. The boys put some milk over the oatmeal while I enjoyed mine with dry topped only with dried cranberries. I actually enjoyed this oatmeal so much that I am looking forward to making this recipe during our upcoming family ski trip. (We normally eat oatmeal every morning because it is a hearty breakfast that gives us the needed energy for the day, but by the end of the week you are normally tired of traditional oatmeal. Not this time!) Jeffrey (the notorious critic of all warm cereals) even enjoyed this recipe and is looking forward to it on the ski trip. Another added advantage of this oatmeal over the traditional oatmeal is you don’t have to babysit and stir it while it cooks. I loved the fact that I was able to mix the baked oatmeal up and then stick it in the oven to bake while I took my shower. Don’t you love breakfast recipes like that? I certainly do. OK, so maybe I don’t always shower while they are baking; however, it is nice to have a breakfast that gives you a break to surf the web or check your friends’ status on facebook and doesn’t require constant attention. Overall I’m excited about this is a great new addition to my breakfast rotation. It rates high in all categories, easy to prepare, easily adaptable with your own favorite toppings and everyone in the family approved and enjoyed it. (Even the warm cereal critic….Jeffrey!) What is your favorite breakfast food? I’m always looking for new ideas. In a medium bowl, whisk together oats, brown sugar, cinnamon, baking powder and salt. In a separate bowl, whisk together milk, butter, egg and vanilla extract. Add the wet ingredients to the dry and stir to incorporate. Pour mixture into a pie plate that has been sprayed with non-stick cooking spray. Place in the oven and bake for 20-25 minutes. It should be lightly golden brown, slightly firm to the touch. Remove from oven, let cool for 5 minutes then spoon into serving bowls. 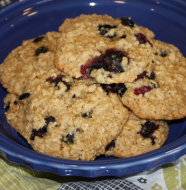 (I ate mine topped with dried cranberries but Jeffrey and the boys topped theirs with milk as well. This is what it looks like fresh from the oven. Adapted from Joy the Baker originally from Allrecipes. 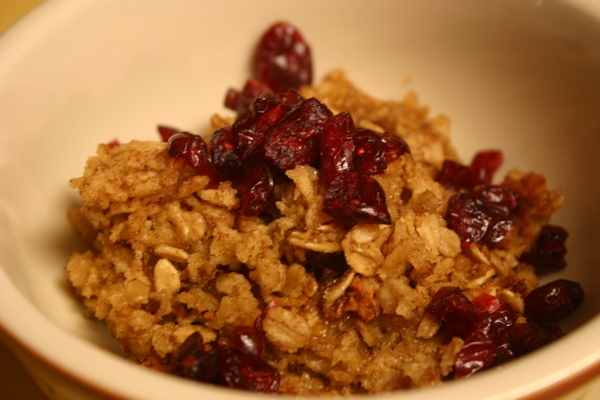 6 Comments on "Baked Oatmeal"
Going to try this tomorrow! Can’t wait! Hi Dinah…. Just made the baked oatmeal!!!!!!!!!!! 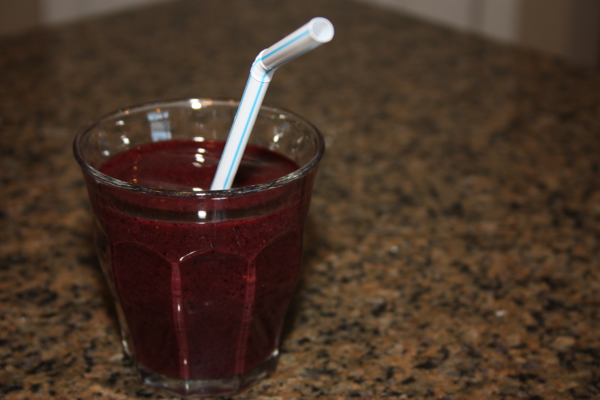 Awesome….Thank you for the recipe…. Made it this morning. It was great! Even my pickiest eater (Lincoln) loved it. I let the kids put a few choc chips in too. Thanks Dinah! Gretchen – So glad it was a hit at your house. We really do love it here. Sometimes I even let the boys put some crushed graham crackers, chocolate chips, and marshmallows on top of their oatmeal as a treat. I love baked oatmeal. I had it the 1st time in PA at a Scrapbooking retreat! I love it. I think the recipe i have is similar and i got it from an Amish cookbook. I love baked oatmeal, but not the calories. 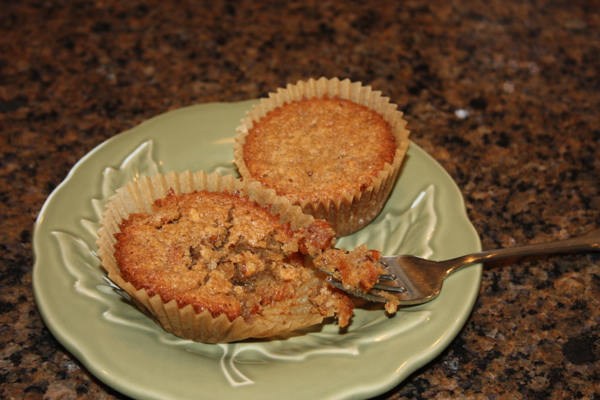 So I was thrilled to find a Weight Watcher recipe that substitutes applesauce for butter. Very yummy.